Isaiah 6:1-2a, 3, 5-7 - In the year that King Uzziah died I saw the Lord sitting upon a throne, high and lifted up; and the train of His robe filled the temple. Above Him stood the seraphim. ... And one called to another and said: "Holy, holy, holy is the LORD of hosts; the whole earth is full of His glory!" ... And I said: "Woe is me! For I am lost; for I am a man of unclean lips, and I dwell in the midst of a people of unclean lips; for my eyes have seen the King, the Lord of hosts!" ... Then one of the seraphim flew to me, having in his hand a burning coal that he had taken with tongs from the altar. And he touched my mouth and said: "Behold, this has touched your lips; your guilt is taken away, and your sin atoned for." Isaiah sees Jesus "high and lifted up," seated in the temple among the angels. The seraphim are crying out, "Holy, holy, holy is the Lord of hosts; the whole earth is full of His glory!" The smoke of incense fills the temple. Isaiah can't cope with it. He is overpowered by Jesus' glory and holiness. The contrast with his own sin is just too much for him. And so, Isaiah cries out too, but not to say "Holy, holy, holy." Instead he says, "Woe is me! I am lost!" His "unclean lips" can't say anything else. He can only confess his own unholiness in the presence of the holy God. That's our trouble, too, isn't it? We are unholy by nature. We try to do right, but all too often we sin with our lips. We lie, deceive, and bend the truth. We flatter, gossip, and backbite. We use our speech to tear other people down instead of building them up. Just like Isaiah, we have to cry out, "Woe is me!" And God has mercy on us, too, just like He did on Isaiah. An angel flew to Isaiah with a burning coal taken from God's altar. The coal was so hot that even an angel had to handle it with tongs. And he touched it on Isaiah's lips, saying, "Behold, this has touched your lips; your guilt is taken away, and your sin atoned for." Do you notice something strange in this story? Nowhere does it say that the burning coal hurt Isaiah. The angel touches it to his lips and Isaiah is forgiven, made clean. He doesn't seem to be suffering. Who took the suffering then? Our Lord Jesus Christ took that part. The burning coal came from God's altar, which pointed forward in time to Jesus' cross. On that altar Jesus offered Himself up for our sin, making Himself an atonement for us so that we would be made clean. His is the suffering; ours is the forgiveness. See how much He loves us! THE PRAYER: Lord Jesus, thank You for taking the suffering that belonged to us onto Yourself, and making us clean again. Amen. 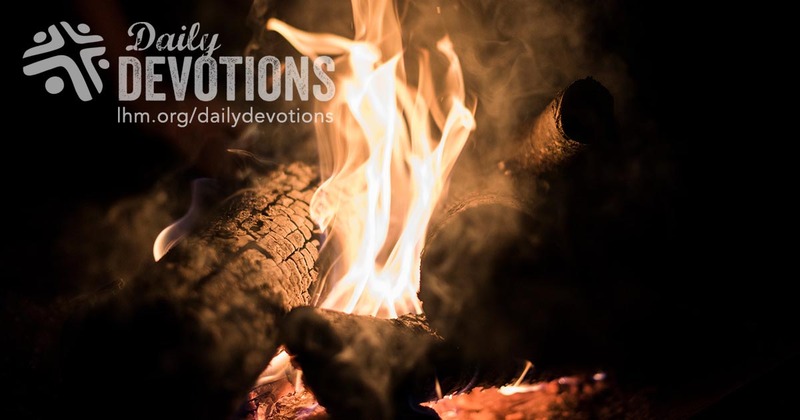 This Daily Devotion was written by Dr. Kari Vo.